Published: Feb. 22, 2015 at 04:25 p.m. Updated: Feb. 22, 2015 at 08:51 p.m.
1. Clemson pass rusher Vic Beasley ran a 4.53 40-yard dash, which was the fastest time among all the front-seven defenders who ran on Sunday. The competition was stiff -- five others ran sub-4.6 times -- but after showing well in various other drills, Beasley was the talk of the combine on Sunday. 2. Florida defensive end Dante Fowler turned in a 4.60 40-yard dash, which was perhaps even more impressive than the faster time of Beasley given that Fowler weighs 15 pounds more than Beasley. Also reportedly a hit in interviews, the former Gators star's draft arrow is clearly pointed up as he exits the combine. 3. Kentucky's Bud Dupree recorded an 11-foot-6 broad jump, just an inch shy of Georgia wide receiver Chris Conley's 11-7 effort Saturday, which tied a combine record. Not bad for a guy who weighs 269 pounds. His nearest competition among the linebackers was Texas' Jordan Hicks, a distant second at 10-4. Dupree has been calling his combine shot since last summer, and delivered in emphatic fashion on Sunday. 4. LSU's Kwon Alexander ran a 4.55 40-yard dash to lead the combine linebackers. He's also one of the smallest at 6-1 and 227 pounds, so that's not altogether a surprise. But it was important for the early-entry junior to establish himself as one of the most athletic options at the position, one who can play special teams and on third down, and Alexander did just that. 5. Michigan's Frank Clark turned in a time of 4.05 on the 20-yard shuttle run, which tests agility, the best time among all defensive linemen. Clark is a late-round prospect who endured a quizzing from NFL clubs about character concerns this week, but to finish atop an agility drill at 6-3, 271 pounds could make scouts take notice. "I came here with the idea that I was going to run the 40. I knew I wouldn't be able to do the position drills because of my injury, but I've been running for 12 days." -- Missouri DE Shane Ray on the toe injury that caused his exemption from competing at the combine. "It gives me a chance to ... be a bully in the middle." -- Washington defensive lineman Danny Shelton on why he prefers to play nose guard over the 3-technique defensive tackle position. Clemson's Vic Beasley not only blazed the best 40-yard dash time of the day at 4.53, but he also finished second among defensive linemen in three other events: the vertical jump (41 inches), the broad jump (10-10) and the 20-yard shuttle run (4.15 seconds). His three-cone drill time of 6.91 was tops among the defensive linemen and the only sub-7.0 time recorded at the position. Throw in his 35 reps of 225 pounds on the bench press (tied for third best of all combine participants), and Beasley secured some big money in Indianapolis. It was borderline unfair for Beasley to be grouped with defensive linemen rather than linebackers, as he would have been the top standout in either group. TCU linebacker Paul Dawson had a rough day to be sure, running a 4.93 40-yard dash that was among the slowest of the linebackers. His 28-inch vertical jump was the worst number in the linebacker group, and his broad jump of 9-1 was near the bottom of the group, as well. NFL Media analyst Mike Mayock had rated Dawson as his top linebacker in the 2015 NFL Draft. That could change coming out of the combine. » Who else shined in Sunday's combine workouts? Bucky Brooks lists four of the day's buzzworthy prospects, and a few who disappointed. "A highly productive kid on the other side of Shane Ray at Missouri. He lacks length. He doesn't lack motor, but he lacks in both size and arm length." -- NFL Media analyst Mike Mayock on Missouri defensive end Markus Golden. "I've been told how football smart he is, his ability to take football concepts off the board and apply them." -- NFL Media analyst Daniel Jeremiah on former FSU quarterback Jameis Winston. » NFL Network analysts took in all the action Sunday from Lucas Oil Field. 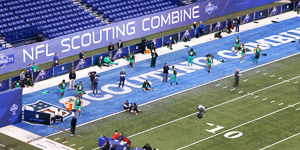 Find out what else they were saying about the combine's top prospects. 1. NFL Media analyst Mike Mayock identified two clubs picking in the top 10 of the first round that he believes have little choice but to draft an edge pass rusher: the Jacksonville Jaguars (No. 3) and Atlanta Falcons (No. 8). Fortunately for both, it's a deep field of top prospects at that position. Possibilities include Florida's Dante Fowler, Nebraska's Randy Gregory, Missouri's Shane Ray, and Clemson's Vic Beasley. 2. Washington pass rusher Hau'oli Kikaha did not run the 40-yard dash, but did do all of the drills. He was reportedly sick before coming to the combine and will run at the Huskies' pro day next month. 3. Shane Ray wasn't the only top prospect to miss the 40-yard dash Sunday. Other top prospects who will turn to a pro day workout to test in the 40 include Rice's Christian Covington, Ohio State's Michael Bennett and Florida State's Eddie Goldman.